What is a Pictogram? Definition: A Pictogram conveys a story and meaning through pictures, signs and symbols that signify and resemble the shapes of physical objects or people. An Ideagram is another form of pictogram which conveys more complex ideas, feelings and emotions. A pictogram is a therefore a form of writing which uses drawings to tell a story. 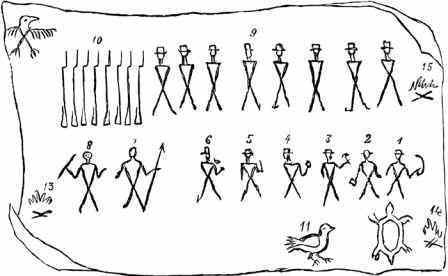 A pictogram was not an exact record and often only understood as a memory help to those who knew the original story and understood the meanings of the symbols that had been used. The pictogram was used in many different guises. 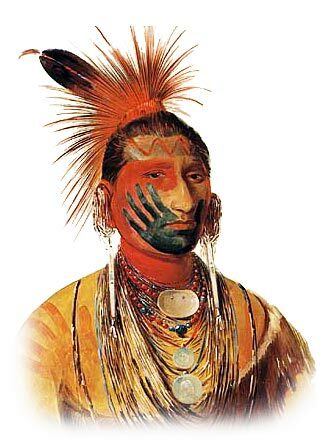 Pictograms conveyed their ideas in basic pictures of visible objects on various forms such as on their war paint, weapons, the bark of trees and the skins of animals which they made into their clothes and tepees. They were also used on grave posts and in ledger books. The meanings of signs and the types of symbols used by Native American Indians are fully illustrated and can be accessed via the Picture Dictionary of Symbols. The symbols dictionary provides information and origin of many symbols and includes reference to Native American legends and the mythology of the ancient Mound Builders and the fantastic creatures and monsters that feature in their culture. Many elements of a pictogram are elemental, basic and logical and provide the means to convey a story and ideas without writing. Because they are so visual children and kids can emulate the concept and language of a pictogram to tell their own stories. The images used in the Picture Dictionary of symbols and signs can be used as a fun basis to illustrate stories and ideas by modern children and kids, whilst learning about the heritage and culture of Native Americans. The following example of a pictogram shows a birch bark drawing. The symbols on the pictogram drawing are fully described via the article on the Camp Fire Symbol. The pictogram depicts shows a drawing made in 1875 by two Indian guides on a piece of birch bark. The drawing, or pictogram, was used as a method of communication. The birch bark pictogram was placed upon an upright pole, for the purpose of informing their Indian companions that a party of 14 white men and 2 Indians had encamped at that place. The picture of the bird in the top of the picture is believed to be a depiction of the Thunderbird. The turtle or tortoise might also have been eaten by the party or might represent a totem, or armorial badge. The article relating to the Scalp Symbol pictogram provides an example of the Delaware Tribe using picture writing to describe a battle and the number killed, or scalps taken. The famous epic poem by Henry Longfellow called �The Song of Hiawatha� was based on the hero Hiawatha who established the Iroquois Confederacy. Henry Longfellow was deeply interested in pictograms and pictography, and gave a brief example and description of nine common symbols used in pictograms in the following verse from Hiawatha.